It's a life of which many of us dream, built on technology including digital video, YouTube, laptops and the occasional drone. American software entrepreneur Brian Trautman says a chat with a guy in a Mexican bar got him into video production, helping fund an idyllic life, spent sailing, swimming, snorkelling and visiting exotic destinations. "He insisted that I walk out right then and there and buy a HD camcorder to film stuff non-stop as we crossed the Pacific," he says. A basic camera bought for $200 helped launch a business model now based on more than 170,000 YouTube subscribers and views that run between 200,000-700,000. What started tentatively for a few young hopefuls has burgeoned into a huge industry with earnings reported to be in the hundreds of thousands of dollars. Top of the heap are Australians Riley Whitelum and Elayna Carausu of Sailing La Vagabonde, who are back in the Mediterranean after sailing the Whitsunday Islands, courtesy of Australia's Queensland Tourism, between taking delivery of a $1 million catamaran, provided to them by a French boatbuilder on the strength of the 300,000-plus YouTube subscriber base built as they sailed the South Pacific. These are among the most successful of perhaps 400 people posting videos of their sailing exploits to the Google-owned YouTube platform. One observer puts annual revenue for the top two channels at a third and a quarter of a million dollars respectively, much of it collected through Patreon pledges. The personable Whitelum says he saved for eight years while working on drilling rigs and service boats off Western Australia before buying La Vagabonde, a 43-foot Beneteau Cyclades in Italy four years ago for $100,000 - about half what a similar yacht would cost in Australia and "a bit of a steal". His "unbelievable" luck has continued from there, starting with a meeting with partner Elayna Carausu, which led to their cruising the Greek Islands and Turkey together. A dive master and musician, she had already toured extensively including around Australia in a small campervan. "I couldn't not take that chance with him and the boat," she says on their website. "I didn't know if I would love life on a lean, but I knew I really did like Riley. I would rather say 'yes' to everything in my life than 'no', and then spend my time wondering what might have happened if I didn't take the chance." The result for the engaging couple has been an adventure beyond their wildest dreams, and a couple of months ago they took delivery of a new La Vagabonde, a 45-foot Outremer catamaran designed for blue water cruising, under an agreement that sees them promote the yachts through regular video posts. (This 20-minute YouTube post covers the celebrations and press conference at the handover). It was Carausu who got the couple into YouTube, when she picked up a neglected compact digital camera Whitelum wasn't using, and started to film their activities for the benefit of those back at home. Production at first using Apple's iMovie has grown in professionalism with Adobe's Premiere and the armoury of equipment has also expanded to include Canon's 6D DSLR and compact PowerShot G7X, GoPro's Hero4 and a DJI quadcopter drone which has its own 2.7K HD video camera. While there's a pretty modest return from YouTube advertising - estimated at $1.50 per 1000 views - the biggest impact has been the groundswell of support from viewers, 1463 of whom were pledging almost $8500 via the Patreon crowdfunding site (at the time of posting) for each of the four videos they typically post a month, supporters they say, they reward with love, gifts and trips onboard. Elayna Carausu is a popular singer in venues when they hit port, and has a covers album for her fans on Bandcamp and Facebook... oh, and there's a range of SLV (Sailing La Vagabonde) merchandise available via their Shopify site. What began as a dream has grown into a sustainable business model, and the telegenic couple can't believe their luck. The evolving story - including plans for the original Beneteau, currently stored in New Zealand - is both inspirational and easy to watch. 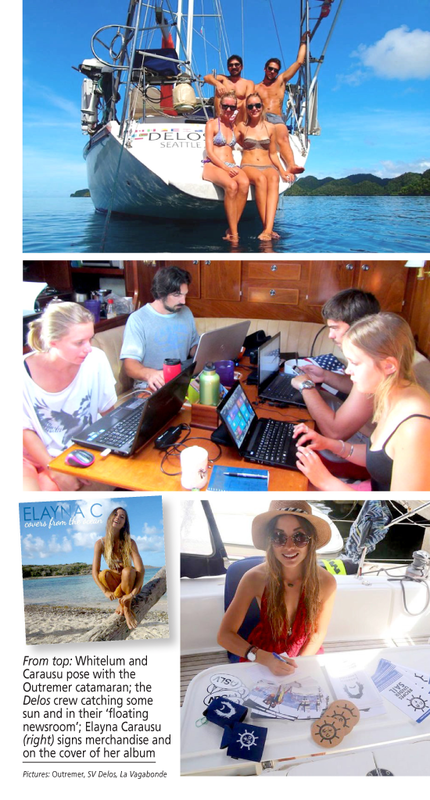 That's a description which equally fits the crew of the SV Delos, the 53-foot Amel Super Maramu in which former Seattle resident Brian Trautman has been sailing the world - usually in the company of a bevy of attractive young women - since 2009. Our US correspondent John Juliano (who sails from the US west coast port) recalls the serious commercialism with he approached the project before setting sail. Again, the financial picture has improved with the following, so the "sail, run out of money, work, sail again" routine which saw Delos slipped in Bundaberg, Queensland, for a year while he and the then crew put some money back in the cruising kitty, are largely over. When they set off again four years ago, the distractions of the Philippines and then Malaysia saw the programme run out to five years, "with no end in sight". One of the most-watched channels in this category, they deliver regular 25-minute episodes as they cruise exotic South Pacific and Indian Ocean waters. Late last year that meant being the only people on the British island of Chagos, halfway from the more-visited Australian territory of the Cocos (Keeling) islands with just a few wrecks for company. As I write this, they were in Mauritius. An old hand compared to the relative novices on La Vagabonde, Trautman says they'd tried Blogspot before a guy in a Mexico bar suggested buying a video camera, an initial $200 investment got them into a YouTube video-log style, lately refined with more gear including a GoPro, a better HD video and a drone. Slowly, the number of views has grown and lately they've been getting 300,000-700,000. The camera equipment and the formula are both similar, with sunny scenes crowded with bikini-clad crew members, visiting to-die-for locations, and supported by Patreon subscriptions and teeshirt sales. While in the past, a very few have augmented their travel costs by writing for magazines and newspapers, technology and the video audiences it enables is delivering an amazing lifestyle unimaginable a decade ago.